Bjorn Kjos, chief executive of Norwegian Air, in Seattle to pick up two Boeing 737 MAXs that will open up new transatlantic routes, also plans further expansion of 787 service from Seattle to Europe. Norwegian Air Chief Executive Bjorn Kjos, in Seattle to pick up two Boeing 737 MAXs that will open up new transatlantic routes to the East Coast, also plans further expansion of 787 service from Seattle to Europe. Because of the “incredible growth” in Seattle, he’s “actively looking at possibilities,” Kjos said. He said advance tickets for the London service have sold well. Norwegian’s round-trip fares on that route, when including additional fees for an in-flight meal and checked bags, start at $650. Further European destinations out of Seattle couldn’t be added before late 2018, Kjos said, because he cannot take additional Boeing Dreamliners any faster. Norwegian already is flying 17 of the 42 787s it has ordered either from Boeing or from airplane lessors. It will take a total of nine Dreamliners this year and 11 more next year. That’s the maximum growth the airline can handle because of the number of pilots it needs to recruit and train. Norwegian will fly its two new Boeing 737 MAX 8s to Oslo on Thursday. Their delivery was delayed for a few weeks by a quality problem discovered in a batch of the LEAP engines built by supplier CFM International. That’s been sorted out, Kjos said, and he’ll take four more MAXs in the next few months. 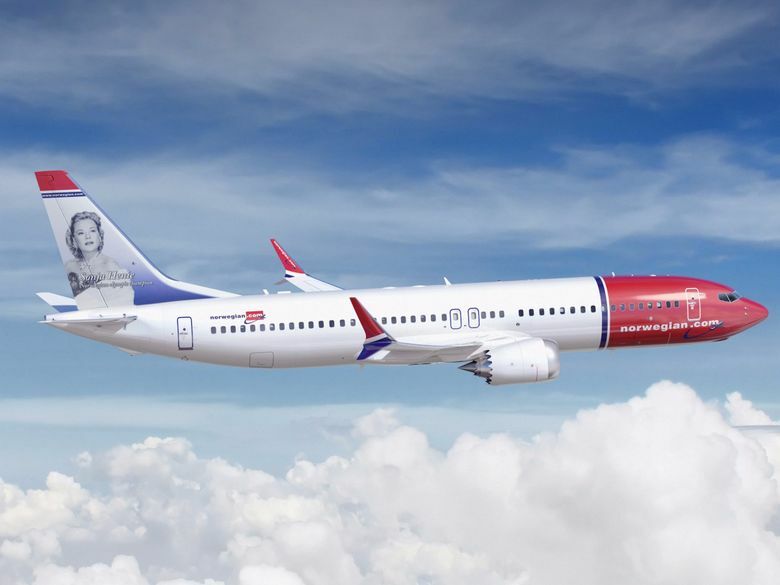 Altogether, Norwegian now has 110 MAXs on order. Many of those will replace Norwegian’s current model 737s. But the first six will be used to open up service in July between Irish cities and the U.S. East Coast. Norwegian will fly the MAXs from Belfast, Dublin, Cork and Shannon into Stewart Airport, 90 minutes north of New York City, and into Providence, R.I.
A coach shuttle service from Stewart to the Port Authority terminal will be timed for Norwegian’s arrivals and departures, and promises to get travelers to the center of Manhattan faster than if they land at JFK. Depending on the date of travel, a round-trip flight from Dublin to New York typically costs around $250 in the low-fare category, with an extra $70 each leg if you buy a meal or check a bag. The airline is setting up pilot and cabin-crew bases at both Stewart and Providence, with about 60 employees at each. As Norwegian expands in the U.S., Kjos said, he’s also opening a 787 pilot base in Fort Lauderdale, Florida, where he already has a crew base. And sooner or later, he said, he’ll open up a crew base at either Oakland or Los Angeles on the West Coast. As a huge MAX customer, one might expect Kjos to be enthusiastic about the largest model, the MAX 10, which Boeing just launched at the Paris Air Show. He’s not interested. Norwegian has instead ordered the longest-range version of the rival Airbus neo jet family, A321LR. That plane uses three auxiliary fuel tanks to boost its range to 4,600 miles. The A321LR “has the range we need,” said Kjos. He wants to use it to fly from Europe to smaller cities in the U.S. Midwest. Boeing insists its MAX 10 can match the range of the A321neo, though it has not discussed the possibility of adding so many extra tanks. But Kjos is not buying it. A consolation for Boeing is that Kjos said he is “definitely interested” in the all-new airplane concept the company is developing for the “middle of the market,” a jet many refer to as the 797. If that airplane were to enter service around 2025, as Boeing has advertised, that would suit Norwegian’s growth plans, he said. It was only 10 years ago that Kjos, a former Norwegian Air Force fighter pilot, ordered the airline’s first new 737s from Boeing. Now his airline is the world’s sixth largest low-cost airline, and his long-haul ambitions aim to open up international flying just as low-cost carriers have opened up domestic flying in the U.S. and Europe. The margins of a low-cost carrier mean he needs and plans to grow big and make money on volume.